APTA President & CEO Michael Melaniphy congratulated the Senate for its leadership saying, "It's a good starting point and it takes us closer to passage of bipartisan legislation that helps our communities and country." He also emphasized that there is more work to be done. > Total transit authorization grows by almost 14.5% in the third year and by almost 25% in the sixth year. > Bus & Bus Facilities program grows by more than 59% in the third year and by over 90% in the sixth year. > State of Good Repair program grows by almost 17% in the third year and by over 25% in the sixth year. > Urban & Rural Formula Grants grow by more than 7% in the third year and by over 17% in the sixth year. > Capital Investment Grants grow by more than 26% in the third year and by close to 36% in the sixth year. After Labor Day, the House is expected to pursue an alternative multi-year reauthorization bill that could be linked to changes in the way American companies' overseas profits are taxed, thereby providing new revenue to fund a six-year surface transportation program. Congress Averts Another Transportation Funding Crisis. What's Next? Congress approved another temporary fix this week to keep the surface transportation program funded for another three months. President Obama signed the bill on July 31, the day that funding was due to expire.The bipartisan extension – through Oct. 29 – was a rare sign of unity on this issue and it came just in time; the House adjourned on July 29 for its summer vacation and the Senate is expected to recess late next week. Congress returns to work after Labor Day. APTA's July Transit Savings Report shows that a commuter can save an average of $9,491 annually by switching to public transit versus owning and driving a private vehicle. The results are based on an individual living in a two-person household giving up one automobile and using public transportation on a regular basis. To see the individual savings ranked by the 20 cities with the highest public transit ridership, please click here. Leaders of four passenger rail systems visited Washington on July 27 and 28 to share their expertise on positive train control implementation and other safety issues. The delegation, which included APTA President & CEO Michael Melaniphy, met with FRA Acting Administrator Sarah Feinberg and several key members of Congress. At left are (left to right): C. Mikel Oglesby, deputy executive director, South Florida RTA; Don Orseno, executive director & CEO, Metra, Chicago and chair of APTA's Commuter Rail CEOs Subcommittee; Melaniphy; and Sen. John Thune (R-SD), chairman of the Senate Commerce, Science and Transportation Committee. 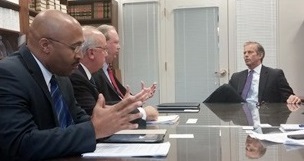 Also participating in meetings were Douglas Allen, CEO, Virginia Railway Express, and Joseph Giulietti, president, Metro-North Railroad, New York. President Obama on July 30 nominated Beverly Scott, CEO of the Denver-based Beverly Scott Associates and former APTA chair, to the NTSB Board of Directors. The nomination requires Senate approval. U.S. Transportation Secretary Anthony Foxx announced on July 30 that applications to DOT's seventh round of TIGER grants totaled $9.8 billion, almost 20 times the $500 million set aside for the program. According to DOT, the demand for infrastructure investments from all 50 states has been overwhelming. "The consistent number of high quality projects we're unable to fund through TIGER every year demonstrates the need for Congress to act to give more communities access to this vital lifeline," Foxx said. For more information on the TIGER grant program, visit http://www.transportation.gov/tiger. The Smithsonian Institution held the ADA Festival on July 26-27 commemorating the law's silver anniversary. The museum hosted presentations by ADA experts and workshops in the performing and visual arts, including documentaries by filmmakers with disabilities. Also on display was a WMATA vehicle and the ADA25 Legacy Bus, which has been traveling across the country. 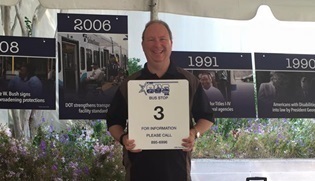 APTA President & CEO Michael Melaniphy (right) holds one of the nation's first braille and tactile bus stop signs that he initiated as general manager in Hamilton, OH. The deadline for the early-registration discount – Aug. 28 – is quickly approaching for APTA members planning to attend the 2015 Annual Meeting in San Francisco. Sign up now for this premier event being held in the city that has more diverse modes of public transportation than any other place in the U.S.
MARTA announces that it will offer free wi-fi and launch a partnership with Uber. Public transit systems provide significant and varied benefits, according to a Mineta Transportation Institute study. San Antonio's "The Color of Blind" art exhibit, which debuted 2013, helps the special needs community better connect with art and the world around them. Watch the video and visit the Facebook page while we celebrate the ADA's 25th year. "The House of Representatives, as a result of our passing a multi-year bill, now feels they should pass a multi-year bill. That's a good first step. And when they do that ... we'll try to work out the differences, and we'll try to agree on how to pay for it."